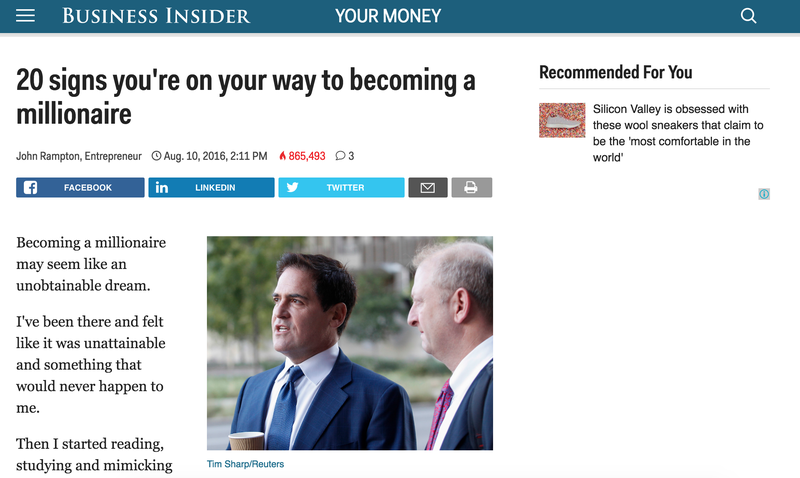 One of my recent stories, entitled, “20 Signs You are On Your Way to Becoming a Millionaire,” was recently picked up by Business Insider. It went viral. Within 24 hours, it had racked up more than 800,000 page views. By the time you read this, I expect that that post will have generated more than a million page views. That’s a tremendous achievement, something that anyone who creates content dreams of making happen. Every time we create a post, we hope that this will be the one that flies across the Web, wins shares, lands pages views and gets people talking. It doesn’t happen every time. But it does happen sometimes… and it often happens to the same people every time. If you look at the posts on outlets like Business Insider, you’ll see the same names appearing again and again on the front page and next to the highest page view figures. That’s because while an article going viral might look like luck, it really isn’t. Like any success, the result is always the last stage in a long process that involves a great deal of planning and work. It starts with the idea for the post and it doesn’t even end once the post is out and winning shares. That’s just where the next process begins. In between those stages will be a lot of research into how to roll the information out, which promotional tactics to use, timing when to publish the post, and even setting aside money to spend on those promotional tactics. It takes a lot of time and effort to make any piece into a show piece. It doesn’t just happen. Usually, that process is invisible. It happens in PR offices and in marketing firms, and the public usually only sees the final result. My recent article though, is a good opportunity to take you behind the scenes. I want to show you the thought process that goes into creating a post that wins over a million views, how it’s created and how it’s promoted. We’ll go right from the beginning all the way to how I capitalize on the success of every major article. Now, it’s important to note that the method that went into making this article successful hasn’t worked on every article I’ve used it on. Audiences are unpredictable. If they weren’t, every Hollywood movie would be a blockbuster and United Artists wouldn’t have made Heaven’s Gate. Even the best plans don’t always work in the way you expect. But it’s hard to imagine a post going viral without the preparation that went into this article. Too many things have to happen one after the other for that to happen. Without preparation and planning, seeing a post go viral is like winning the lottery… which is to say that it happens sometimes, but never to you. When Candace Payne pulled a Chewbacca mask over her face, for example, and broadcast the toy over Facebook, there was no planning and no preparation. She was only intending to talk to her friends, but her joy and her laughter were genuine. People wanted to share them. Candace, who has since been on Good Morning America and The Late Late Show with James Corden, and was also given a giant pile of free products by Kohls, the store where she bought the mask, hit the lottery with that post. And that sort of success happens about as often as picking six numbers and the Powerball. Most viral articles don’t happen that way. They’re more like the Old Spice campaign starring Isaiah Mustafa which generated nearly 105 million YouTube views in 2010, as well as 1.2 billion earned media impressions and a tripling of the traffic sent to OldsSice.com. The videos were created by leading advertising firm Wieden + Kennedy, and when the brand responded in real time to questions sent in by social media, they had a team of people in a studio filtering the questions, putting together replies and shooting the responses. The videos were seeded to influencers who recommended them to their audiences and spread them deliberately across channels. It wasn’t just great content; it was also great organization. My post wasn’t as complicated as the Old Spice ads. And it didn’t have a seven-figure production and promotional budget. But it did have a plan, preparation, organization and a budget to make it all happen. This is what I do to create viral content. Coming up with ideas for content posts isn’t difficult. Much harder is to come up with an idea for an article that has a chance of going viral. Research is vital. Business news: Have there been any major deals that could affect my business or those of my readers? Has the economic climate changed in a way that could make sales easier or harder? Has anything happened in the business world that could affect my chances of success? For example, the sale of Yahoo to Verizon was a huge business story and one that fell right into my space. My company is digital. Like many online businesses, I have to understand how online advertising works. That sale might affect me, and it could affect my audiences too. But it wasn’t clear how and trying to explain the possible effects on Internet advertising felt too technical to be viral. More interesting was that this was a company that someone had built at the start of the Internet, watched it become successful, then let it slip out of his hands. That’s a fear that does touch us all every day. Consumer trends: What products are people are talking about right now? Have any new products been released that will have an effect on the market? Are there any signs that people have stopped buying a popular product? For example, one of the most popular articles of the year was a post about how small businesses were using Pokemon Go to drive sales. It came out just as the Pokemon app became the story of the day and it very neatly brought together practical, moneymaking advice with a topic that was on everyone’s mind. You have to be quick with those sorts of stories but if you can get the right angle, the story can really fly. Audience moods: This one’s harder to gauge but you can form an impression of an audience mood from the tone of the stories in the press. If there’s just been a major terrorist attack, for example, the mood will be sombre and downbeat. If the Olympic team has just returned home with a giant haul of gold medals, it will be more optimistic. Push a story that’s out of sync with the general mood and you’ll struggle to gain traction. I look for these impressions in a number of places but two of the most useful are Google Trends and Twitter. Google Trends tells me first what people are looking for on Google. I can see immediately what’s on the minds of audiences and what information they want to know. I check it regularly. But while that initial information is interesting it’s also limited. This is where things start to get a bit more interesting. Each of these headlines contain three pieces of information: the number of passengers affected; the location; and the reason for the evacuation/rescue/abandonment. I’m not a journalist. I’ve never been a sub-editor at a newspaper. No one has ever paid me to write headlines for stories. The people who wrote those headlines though are professionals and they tell me what needs to be in a headline to make people click. I do the same thing on Twitter. A quick glance at the trending topics tell me what’s on people’s minds at the moment. Click one of those topics and I can see the most popular stories that are winning audiences for them. I can also look at Moments, Twitter’s news app, but I don’t just want to see what everyone is talking about. I want to see in particular what the people who follow me and the people I follow are talking about. That’s more interesting to me. Trending topics, like other aspects of social media, are geared towards delivering targeted information. Checking regularly on both those sites to see the most common headlines lets me gauge what people are interested in reading. It helps me brainstorm my own topics and present them in a way that draws people to my content who will benefit from it and enjoy the material. That doesn’t mean that I’m going to spot a trending topic, copy a popular headline and churn out a story though. Google Trends and Twitter give ideas and inspiration. They don’t give me stories. This article on the signs of becoming a millionaire wasn’t on any trending topics list. But many of the business stories I saw that day made me think about the millionaires who had set up those companies and the characteristics they possessed that had made them so successful. I figured that if I thought about what it takes to be a millionaire then other people would think about it too. That was what gave the article the potential to go viral. It was popular because so many people are already focused on the idea of becoming financially successful in their businesses and in their personal world. That desire to create something and become a success, felt by entrepreneurs, freelancers, and even traditional workers, meant there was always an audience for this content to spread across the Web. So looking at the day’s business news had given me an idea. Looking at the headlines meant I knew how to present that idea. But I didn’t want to just present a straightforward list of traits. That wouldn’t be too interesting. You never know when an opportunity is going to present itself. And, if you immediately shut the thought of investing in this opportunity, then you could be losing out on making a fortune. When I started my online invoicing company, I saw an amazing domain and had to make a six-figure purchase in a matter of three days. This meant moving around some money and convincing my spouse to go along with it. We both have open minds which help this process even happen. By adding my own anecdotes, as well as insights from other millionaires, I added relevancy and authenticity, upping the interest factor. It also doesn’t hurt to inject a little humor into the content. Jokes won’t appeal to everyone but they always reflect your own personality. Even if the content is relevant and engaging, it doesn’t matter if it doesn’t get out there where people can easily find it and share it. I spend a lot of time studying the various tactics that people use to promote their posts, and I test to see which approaches best help me put the content in front of the most relevant audiences. That might sound strange, but viral content is never just about the content itself. Even if you create content that pushes the right buttons, generates the right emotions, and produces the right amount of curiosity, the audience won’t do the rest by itself. Or at least, they won’t do it quickly. You can think of the process as similar to seeding a new lawn. Throw a handful of seeds into the middle of the yard, and they’ll grow, scatter more seed themselves and eventually spread across the yard. But if you only scatter a few seeds and only place them in one part of the yard, it will take a long time to fill in all the gaps. If you spread lots of seed widely, though, you’ll have more grass that will spread more quickly, and you’ll fill your lawn faster. That content seeding happens in three ways. The first is under your own control. I don’t want to rely solely on my blog’s organic audience to create the groundwork to go viral, so I also post each article I write on my Facebook business page, as well as on Twitter and on LinkedIn. That alone gives the post a potential audience of more than a million. In practice, of course, it’s nothing like that. Studies have found that fewer than half of Twitter followers log in every day. If I post a link to an article on Twitter on just one day, the most I can expect to reach is half my Twitter followers. That tweet has also been said to have a half-life of no more than 24 minutes. Or to put it another way, half of a tweet’s total engagement will take place within the first 24 minutes of its publication. I can tweet the same post multiple times but there’s a limit to the number of times I want to annoy the people who have seen it, so I know when I post on Twitter, I’m only going to reach a small fraction of my potential audience. Another option is to tap into other people’s audiences. In addition to posting on my own social media accounts, I also have others on my team post and share the articles on their social media sites. My team isn’t huge but their business accounts do have a number of followers so I get to expand the potential audience. This helps extend the reach of the article without using any resources. And I can go further. Bloggers and influencers aren’t competing with each other for audiences. If one person likes an article I’ve written, that doesn’t mean they can’t like an article that someone else has written. On the contrary, there’s a good chance that they’ll also like a good article written by another influencer who helps entrepreneurs to grow their businesses. So in addition to having my team spread the article, I might also write to other influencers I know and some of my friends in the blogosphere and ask them to promote it as well. They won’t do it because I ask them. But they might retweet it and share it if they think their own audience will benefit from the content. So I can seed the article pretty widely without having to reach into my pocket. But that is not to say that I don’t also spend money as part of my promotion tactics. Just as a tweeted link will only reach a small portion of my followers so a post on Facebook will only appear in the timeline of a small percentage of my page’s fans. Facebook does that deliberately. To keep timelines filled with content that users are most likely to find interesting, it sends out a post to a few people and checks the response. If lots of followers click or share or add a comment, the algorithm releases the post to more people. If the post is ignored, Facebook quickly stops distributing the post. But even if a post proves popular, Facebook will still cap the percentage of followers who see it. Organic views could be limited to as little as five percent of total followers, depending on whether the content is a link post, a video or an image. If you want to reach more of your followers, and if you want to reach people who aren’t your followers, you have to pay. That’s what’s made Facebook a multi-billion dollar company… and it’s also what helps to turn a post viral. So I boost some articles on Facebook with paid placement. I pay to send them to a higher percentage of my followers, and I also send them to people who are similar to my followers so that I can raise my profile on the site. Facebook makes that very easy. The platform’s big advantage over other social media platforms is the number of people it contains and the data it holds about them. I can use its advertising tools to reach small business owners, people who follow other influencers, and people who have attended entrepreneurial conferences. Those are exactly the sorts of people who are most likely to respond to an article about the characteristics of millionaires, and they’re also the sorts of people who are likely to stick around and read more of my content. The reason I invest in paid promotions like these is that I can see them working. The analytics tell me that they are having an effect. They show me in real time not just that more people are seeing the link to my post but that they’re clicking through to read it, and they’re sharing it with their friends. So while you will need a budget of perhaps a few hundred dollars (though you can make do with less) to promote a potentially viral post, because you can track your stats, you can pull the money out quickly if you see it’s not working. If your analytics are showing that Facebook is not helping your efforts, then you can cancel that placement and suspend the campaign. Nor is Facebook the only place that you can use to promote your posts. I tend not to use AdWords for these promotions—it’s too complex and I think people are less likely to click an ad than a piece of content in a timeline—but I might use email lists. I have a large email subscriber list of my own and while I don’t have to pay for the addresses, distribution does cost a little. But in return I get to scatter the post even further, and I can encourage those readers to share it with their own friends. I mentioned that a tweet has a half-life of about 24 minutes before it gets crushed under a pile of new tweets. Send it out at a time when no one’s watching, and those 24 minutes are going to be largely wasted. Whether you’re promoting your post on Facebook, Twitter, LinkedIn, or even by email, timing really does count when it comes to generating viral content. It’s important to understand when your key audience is online. You have to know when they’re looking at their social media pages and you should even know when they’re checking their email. Now, you have to be careful here. Many of the social media sites and email companies will provide some insightful data on peak traffic times. That can ensure that your audience sees the content you post. But that data can be hard to read accurately. You have to know what the data is measuring. There have been plenty of studies, for example, into the best times to send marketing material by email. Some studies have said that Tuesday is the best day. Others say that weekends have the least competition. The best time can be 11am but it might also be late at night as people check their emails before going to sleep. But bear in mind that that data often looks at open rates and conversion rates. When you’re trying to send a post viral you want a different metric. You’re not trying to sell so the action you’re looking for isn’t an order or a request for more information. It’s a read and a share. You can use the hundreds of different studies into email optimization as a guide. And you should certainly look at your social media analytics to see when your followers are most likely to be online—and in a position when they’re available to read—but use your own experience and your own metrics to discover the optimal times to post. In practice, when I’m trying to make a post go viral, I post at different times. Usually that’s not 11 am. It’s more often in the afternoon hours when people are more likely to check their social media accounts as a diversion from work or because they are in a time zone where it is actually their evening time. I don’t just want to catch them when they’re in front of a screen. I want to catch them at a time when they can sit back, read what I’ve written and send it to a friend without suggesting that they’re reading the Internet when they should be working! The other tactic I use is to post two to three times in a 24-hour period. That further ensures that as much of my audience as possible has actually seen the content in their news feeds. All of that research and promotion sounds like a lot of work, and I didn’t even discuss the writing! But if I’ve done everything right, if I’ve picked the right topic and shown it to the right numbers of people at the right times, I’ll be able to see that piece of content go viral. I’ll be able to take my foot of the gas and just watch it fly. At some point, it just reaches its own escape velocity and the page views just rack up by themselves. And that’s when the next stage begins. Once the content does go viral, I check to see which outlets and sources have picked it up. For “20 Signs You are On Your Way to Becoming a Millionaire,” the big pick-up came from Business Insider. They were interested in this piece and asked if they could publish it. Of course, I agreed, and their large audience helped to push the post into the stratosphere. All of the preparation and research that I did generated thousands of views. But its most important result was to bring the content to the attention of Business Insider. It was really down to them that content was able to be viewed by so many more people in such a short amount of time. So I make a note of who has picked up which pieces of content so that I can plan future posts based on those responses and on the targeted interest. It’s another way of making sure that my customers receive what they want to read on the sites that they have chosen to visit. And I don’t stop there. I also try to keep the momentum going by linking to each piece of content that goes viral and I reference it in other content. The information continues to get out there. It continues to be viewed and shared by those who might have missed it initially. Those future links increase the lifespan of a post. Finally, when the viewing numbers start to drop, I take a step back. I reassess the content and the tactics, including placement and timing, to determine their effects. I want to see where sudden spurs of interest came from and what may be inhibiting viral momentum. I then adjust the subject matter, placement and timing of my next post to take those figures into account. Creating viral content really is a blend of art and science. You have to continue testing different content, outlets, and strategies. But most importantly, you have to give people the information that they want, make them smarter and make their lives richer. Do the research, the work and the preparation, and you too will be racking million-view posts.